Oh, dear readers! You are in for a treat! Cindy Woodsmall lured me into the Amish fiction world all those years ago with her Sister of the Quilt trilogy, Since then I have devoured everything she has written, But Woodsmall’s latest release, Ties That Bind (first in her Amish of Summer Grove series) reminds us all why she is one of the forerunners in Amish Literature. It is gripping. It is engaging. Just…wow! 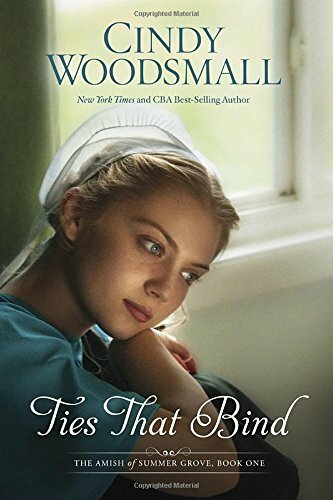 Ties That Bind tells the story of 20-year-old Old Order Amish Ariana. She makes the best of bad situations. She loves her community and is fiercely loyal to her family (parents and all ten siblings, including her twin brother.) She has had to do without, both in money as well as relationships – as Quill, the guy she hoped to be her beau at one time, left her community in the middle of the night, along with many others. I was given Ties That Bind in exchange for my honest review. Well, you’re going to have to hold me back! I thought it was stupendous. THIS is what Woodsmall does best! She has layered the plot and subplots so deftly…before you know it, you are reading well into the night because there just is no other option! This is yet another Woodsmall must-read. I cannot wait for Book Two in this series. If it is half as good as Ties That Bind, I will gladly be losing more sleep! Blessed be the Ties That Bind! Susan Ferrell and her husband make their home in the Atlanta Metro area. Although Susan struggles with chronic migraine headaches, she stays very busy as a stay-at-home mom to one very precocious little girl. While catching her breath, she feeds her Amishaholic tendencies by reading vast amounts of Amish literature! Susan is a book reviewer for Destination Amish.